Compiled by Professor Y. Coopoo, University of Durban Westville, Medical Committee SARFU. The face of rugby has changed. What should the skills and abilities of a perfect player be? They are professional, earning thousands per month. They’re idols and sometimes even icons. If they keep on winning. They’re earning huge incomes playing the game they love, but the game is very competitive, and their period of fame limited and insecure. They must be in the best physical condition possible to coin in as long as they are able. They are professional rugby players. The face of rugby has changed. The modern game of rugby requires more skilful utility players with extremely high levels of all around fitness, yet requiring specific fitness for specialist positions, writes Professor Yogo Coopoo, head of the Sport Science, University of Durban Westville and member of the Medical Committee of SARFU. Long gone are the days of overweight, fat forwards. They must be mobile and agile, but strong. The backs must be stronger to tackle well, must survive the more physical game better and must be able to stay on their feet. The rules of the game have changed, the players are more professional, and there is a greater risk for overuse injuries and staleness, writes Prof Coopoo. The rule changes have resulted in a more flowing game, which results in longer periods of play without stoppages. • More ball in play during the game – fewer scrums and lineouts. • More power play required in rucks and mauls. • Play is at a higher work intensity – almost throughout the game. • Players' anthropometric profiles have changed because of the changing demands of the game. More imploding forwards and backs are required – players with more muscle than fat. • Most national rugby players are full-time professionals. • More time for players to get fit and skilfull. • However, fine balance between optimal performance and overtraining. • A greater reliance on the advice and wisdom of the medical team. • For game preparation a team approach is required in the modern game – expertise from various professionals is required. • Speed/power to overcome inertia, for short powerful sprints, ability to sustain speed power, jinking movements, fast break-aways and for exploding through a tackle. • Anaerobic power for the ability to run and play rugby at the highest intensity for short periods of time. • Aerobic power for the ability to run and play the game at the highest intensity for prolonged periods of time. • Balance for maintaining balance after emerging from a tackle, ruck or maul. Ja, no matter how fit they are - they cannot go on playing 30-40 games year after year. That has nothing to do with fitness. Further to what Donner's article espouses, these are the First Three to the Breakdown figures for the AB/Lions 2nd Test. As can be seen, a prop got to the breakdown first the third most and another prop got there the 6th most. A very far cry from the days when a sauntering prop was barely in your peripheral vision on the edge of the TV screen. The game has changed a lot!! Sorry, I don't mean first, I mean in the first 3. Aye, I was thinking of Flippie too. I just love the diversity on this site. From stadiums to fitness to pretty girls that cheat. From Greek gods in the NEC to boere in Nam, from vleis in the bush to some poor oke in the UK, from rain in the Free State to drought in Limpopo. You can bet we will try our utmost. i am with jj here, good work everyone. on the subject, it really does not need a genius to figure out we are killing our players - why is nothing done??? have we become so money driven that the size of the newscorp deals overshadows the well being of our hero's? It's cos you frighten us with your radical ideas! OO what is your plan. We might just start something. revolution is not for the faint harted- even if it is just to get rid of the Rugby fat cats and to create a better game for all. it is called participation in democratic processes. Even if all of us- likeminded RugRats join clubs in their respective Unions the influence on a 23/2 decision will be nothing. 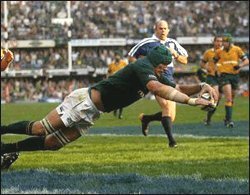 If Ruggaworld starts a campaign by promoting all to join the said club, block vote in the running of that club will be formed- at some stage critical mass will be reached- if the job is done properly and then some influence can be asseted on decision making structures that is running SA Rugby. for "a better game for all"
Not the strike itself, but the whities are still scared of the way Smuts ended it. Lets get " A BETTER GAME FOR ALL"
So that is the background, asked Donner to send you my mail of yesterday- that is if he had not deleted it yet! We are working on it!!! Pack the AK's back in their oil cloths for now!! We are awaiting a reply on something. As demanded by the fans for the fans. The ULTIMATE stakeholders in the game. Not the administrators, not the sponsors, not the broadcasters, not the middle men, not the wheelers and dealers, not the shadowy murky figures in the background! Just your ordinary, everday Joe Bloggs committed, passionate rugby fan. We want it cleaned up. Right NOW! A better game for all!! Just imagine this for a minute. If we could claw back all the middle-men fees, all the litigation fees, all the 'commissions' paid out by SARU, we'd be the richest union in the world. Instead we make fat cats fatter. We make shadowy, annonymous background, conniving figures rich at the expense of passionate South African rugby fans. A better game for all!!! okes - what's a RugRat? Donner coined the phrase as a description of the people who hang out on the site. I like the revolution idea. So once the revolution succeeds do we put all the fatcat administrators up against a wall with blindfolds and cigarettes? Cool - count me in! I love revolutions. OO - you wanna mail me the details, once you have them finalised? I like the idea OO. Sounds a bit serious, but what the hell. Where do I sign up? Must I bring my own burning tires, or will they be provided? Any gun do, or must it be AK's. I can just imagine it, a bunch of bloggers blocking streets and shooting BvR with ak's ! Okay that was a joke, but seriously, I like the Idea. Donner, please send me that email if you still have it. Get as many SA RUGBY fans- real ordinary people like us Vleis , leekkading WPW to sign up as this revolution is not about the colour thing is SA rugby. Use Ruggaworld to grow the RugRatRing, then decide on targets to achieve- onviously no-one is going to lift a gun, it is about organising likeminded opinion against the nepotism and patheticness that rulls our rugby, not only at SARU but also at your union. Other steps to be identified. Here we go again - what is it with the SA rugby fans - how the devil can you possible say who should be the first to the breakdowns. The first three to the breakdowns are obviously the nearest three. The could all be forwards or all backs depending on where the breakdown occured. In almost every case the first three contain a mixture of backs and forwards. And then you have the fly boys (like Chris Jack) who very seldom make the effort to get there first. Tell them Patrick, tell them!